You have an adorable house! I love your style. Merry Christmas! Greenery atop the refrigerator! Inspired! Linda- your home is absolutely charming! I adore your happy colors! I can see the Christmas tree smiling too, so proud to have been chosen! Love the photo of the sweet pup in your kitchen! Linda, your home is fun, full of love, and color. You may call it "imperfect," but I call it perfect! Love it, love it, love it!!! Merry Christmas and a Happy New Year! I love it Linda. It's beautiful! I love your home! It has so much style and personality (which is RARE in VB)! Merry Christmas! These are sooo beautiful decorations! I never have seen in my life that people are decorating their houses so much, so rich like here in the U.S. Very nice, I love it! As always, I love it all! You always decorate in a way that makes it look so easy & effortless, knowing your laidback personality it is just that. I am so jealous though that my sill paperwhites still have not bloomed, nor my amaryllis. What a wonderful post. Thanks so much. Your home is lovely and the holiday decorations are simply beautiful! Merry Christmas. The peace banner is wonderful. Love the stockings. Linda, I love your Christmas decorating. So cheerful and colorful! I also loved your story about your wedding and heading off to the Swiss chalet. Thanks for sharing. Hope you and your family have a very Merry Christmas. Linda, your home looks spectacular decked out for Christmas! May you and yours have a wonderful Christmas week. I'd like to move in please. I LOVE the painting on your wall and I love the wreath hanging on the window. Beki...of the pampered sort....and anyone else interested in the art (and WHO wouldn't be says I)please check out the person responsible for much of my beloved art...Ginny Piech Street, artiste extraordinaire. And...show her some LOVE. She is AMAZING! I LOVE your Christmas tree Linda - I remember adoring the one you shared on GI years ago too - such a delightful tree in every way and sorry girlie but your whole home IS perfect... just perfect. In every way. and Happy Anniversary - well done , 20 years !! I love imperfection Linda, so this post has won my heart! The warmest of Christmas greetings to you from the sunny Adelaide Hills, visiting your blog this year has been such a lovely experience. I love, love, love your blog and your holiday decor! Merry festivity to you! I love your house! Happy Christmas! Have a wonderful holiday, Linda. May you have a fantastic New Year. Merry, Merry Christmas my dear friend. I hope you and yours have a lovely holiday. Happiness, Love & Peace to You. What an adorably perfect, imperfect Christmas home! Love it!!! PS, what is your back-splash, behind the sink???? I love it! oh...loving that tree of yours...you home simply SINGS warmth and love..
Peace of the season to YOU! Your home looks so lovely, all decorated for Christmas! Hope you have yourself a Merry Little Christmas and all the best for 2009!!! Your 'imperfectness' is beautiful! I love it... happy holidays to you. LINDA! You won the napkin rings! YAY! I just need your address, and I'll send them out ASAP! OOo, and by the way, I want that side table/stool by your sofa in the Christmas tree photo! LOL! That was such a lovely house, you did great. I'm in love with your tree, it looks so festive and cheerful. Happy Holidays. Linda, who needs the other house tours you always share, yours is the best, happy, warm, fun and one to be proud of....Merry Christmas from the Pacific Coast to your Atlantic! Linda, your house is absolutely beautiful :) Everything looks so warm and cozy and loved. I hope you have a wonderful and Merry Christmas! Absolutely perfect! I love the pictures. Your home looks just beautiful! Merry Christmas! I hope you are having a Very Merry Christmas! I love that picture of the stockings hung on the piano with care! And, I agree, a nice clean kitchen is just about the loveliest feeling. I just cooked a nice Christmas dinner, and my husband spent 45 minutes cleaning up the kitchen- what a lovely gift! Your home looks fantastic...I just love it. Hope you had a Merry Christmas in your beautiful home(and boy do I love that black and white bassett hound photo!). Merry Christmas to one of the coolest chicas I know. Gorgeous tree, beautiful house...full of warmth, love and kindness. Wishing you and yours, Miss Linda, a cool yule! Linda, I came by to say congratulations on winning the cute little palm napkin rings over at Artie's Blog! Congrats!!! and now that I'm here, I can't believe I haven't been over before - your blog is fabulous!! I love your home, it's gorgeous, and so lovely all dressed for Christmas! I'm adding you to my favorites, and I will be back to visit if that's ok with you! Looks pretty perfect to me! Hope your day was merry!! You all are THE best blogger folks around...I am SURE of it. Thank you to each and every one of you for your wonderful comments. Hoping you all had a beautiful week! And guess what? I just passed 100 posts. Hmmm time for a give away (or give back) me thinks!! Oooh, I love the stockings! 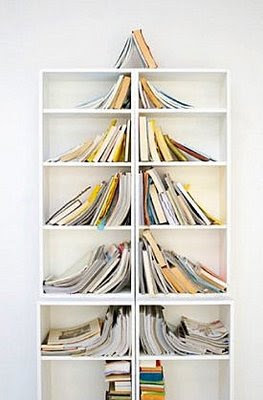 What a fun book tree. I adore your house - you have such a great sense of style. your mother's house is my favorite - I wish I had one of those in my back yard, I would move my mother in law in there today! So pretty & such a home! for the comment on my blog & I'm loving yours!! !